Arrival on Leh Airport you will be met our representative and drive towards. Meet & greet and transfer to the Hotel. Welcome drink on arrival. We recommend you completely relax for the rest of the day to enable yourselves to acclimatize to the rarefied air at the high altitude. After breakfast at hotel visit to Samker Gompa & Leh Bazaar, leh palace, Samker Gompa after Samker, visit Leh Monestry/Shanti Stupa. Walk back or Drive to Leh. Afternoon free for personal activities. After breakfast at hotel proceed to Shey, Thiksey, Hemis, Stok, and Sangam. Shey was the ancient capital of Ladakh. Thiksey - is one of the largest and most impressive Gompas. 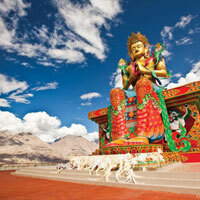 It also houses a two - storied statue of Buddha which has the main prayer hall around its shoulder. Hemis - naturally protected and hidden at the bottom of a gorge, the largest monastery of Ladakh. It has the distinction of the largest treasured Tangkha the country that is held only once every 12 years. (Confluence of Indus and Zanskar River). Dinner and over night at hotel. After breakfast at hotel drive to Uleytokpo Camp en-route visiting Spituk and Alchi. Spituk monastery standing on a conical hill with three chapels was founded in the 11th century but the buildings in a series of tiers with courtyards and steps date from the 15th century. 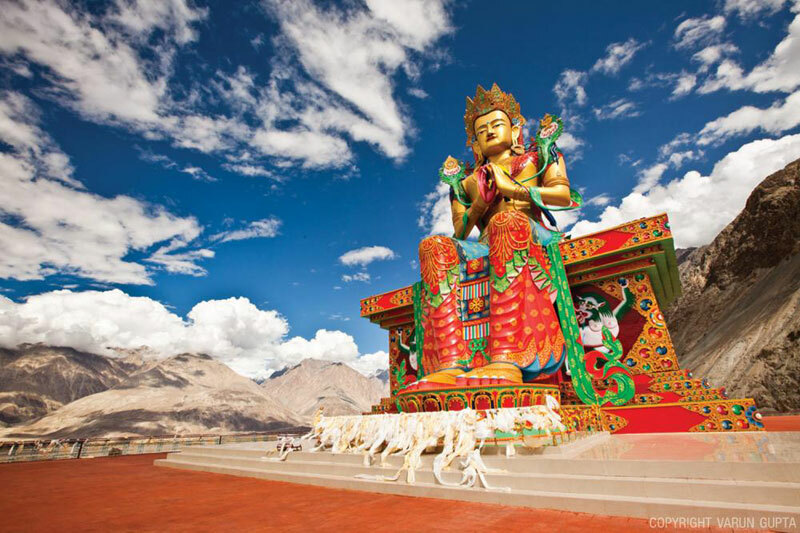 Alchi the most beautiful Gompa of Ladakh also called Jewel among the central Ladakh's religious sites. It's known as Chos-Kor, or religious enclave. Likir Monastery. Likir was built during the reign of Lachen Gyalpo who installed 600 monks here, headed by Lhawang Chosje. After breakfast at hotel proceed for full day excursion to Lamayuru which is 55 kms from Uleytokpo. The 11th century monastery, one of the earliest seats of lamaistic learning and most picturesque monastery in Ladakh. The oldest monastery of Ladakh. The Lamayuru "Yungdrung" Gompa is remarkably built on a: rock around 125 kms west of Leh on the Leh Srinagar highway. It belongs to the Dringungpa order of Tibetan Buddhism. Drive back to uleytokpo. Overnight in camp at Uleytokpo. Leave for Leh on the same route you came in Nubra. Early morning, proceed to visit Rizong Monastery. It has a monastery and a nunnery, which accommodates lady monks or Nuns locally called as "Chomos". After visiting Rizong Monestry drive towards Leh en-route visiting Before arriving into Leh, visit to Phyang Monastery, this is 17 Kms from Leh, built by Tashi Namgyal in 16th century A.D. and belongs to the Red Cap Sect of Buddhists. On arrival in Leh, check-in at hotel.